So many close three set matches, we couldn’t give our match of the week to just one, so we picked three! First up, Ethan Lim vs Chris Parks in our Brisbane Tennis League. Ethan coming out on top 6-4, 5-7, 1-0 (10-6). Ethan climbing the table and getting himself in the mix for a grand final place. Second up Paul Kang (pictured) beating Yusuf in our Sydney Parramatta Tennis League. Paul losing the first set 2-6, but battled on to take the second 7-6 and closed out the third set champions tie-break 10-4. And finally, John Strachan playing Ryan Skorzewski in our Perth North Tennis League. Two players who have been playing in our Perth North League for a while battled out an epic three set thriller. John eventually coming out on top 6-2, 4-6, 7-5. 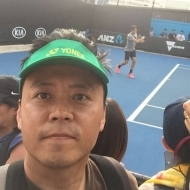 Not a regular feature for us, but a special shout out to Jack Martin, from our Melbourne Inner City Tennis League for posting a video on our Facebook page. Check it out here: Jack Martin vs Cristian Riquelme. We love it! Enjoy the next week of our winter season, fingers crossed for some sunshine!